Every once in awhile I like to do a post that makes people say “I never knew that was there!” I think the Woodland Trail at Delstate qualifies as one of those posts. I was saving our visit to this trail for when I had about an hour I had to kill with the kids and the opportunity arose recently so I was excited to try to find it! Go in the main entrance to Delaware State University and turn right. Continue around past the football stadium until you see parking lot #4 on your left. That is where I parked and then walked the rest of the way. Unfortunately, there is no where to park right at the trail and there are no sidewalks along the road, so use caution as cars sometimes fly through on that curve. Also, I would not go at dawn or dusk just to be on the safe side. The beginning of the trail! We hit log flipping gold here when we stumbled upon a huge pile from a tree that had been taken down. 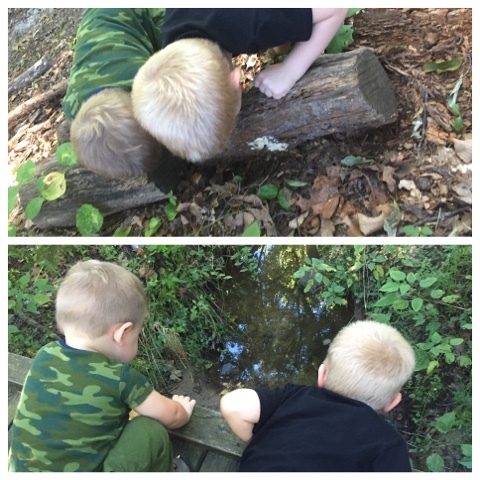 The boys could have spent an hour looking at all the worms, ants, beetles and other creatures underneath them. 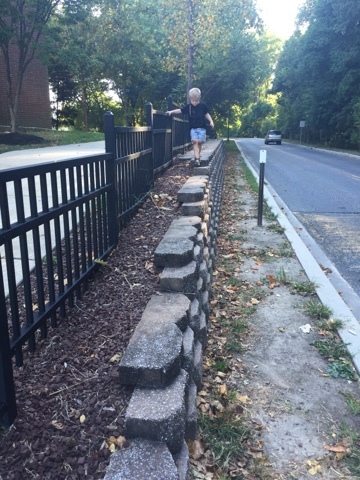 If any of you have been reading my blog posts for awhile, you may have noticed that my 4 1/2 year old hates to walk. He always wants to be pushed in the stroller which is getting more difficult. It also hinders his experience on our nature walks if he’s just riding the whole time. On this trip, I bribed him in to walking and before he realized it, he was having a great time on an acorn scavenger hunt. He found green ones, brown ones, tall, skinny, big, small, medium and twin ones. Ones with caps, ones without caps and just the caps by themselves. It was very interesting to see the variation. The one down side of this trail being at the University is that it seems like it’s a hangout spot for the students and there are places where trash is plentiful. Use this as a teachable moment and talk about why we don’t litter and if you’re feeling extra inspired, go prepared with gloves and bags and have your kids help you pick up trash. You can even take grabbers and make a game of it!